We provide surgical treatment for medically intractable trigeminal neuralgia. As it is also caused by veins, arachnoid adhesion or brain tumors, it is crucial to obtain accurate preoperative diagnosis. Fig.1　Trigeminal nerve (white) is compressed by tiny artery from the opposite side of the nerve. In order to make accurate preoperative diagnosis, optimized sequences are used to take MR imaging, then they are transferred into workstation to create 3-D image. Once 3-D image acquired, the image can be observed from any direction to evaluate specific pathological conditions of every patient. This procedure contributes to make accurate plan for safer and faster operation. 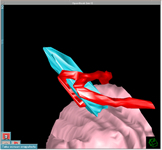 Fig.2　Trigeminal nerve (blue) leaving from brain stem (pink) is compressed by small artery (red). Right, enlarged figure. Microvascular Decompression (MVD) can be only the curative treatment as the culprit vessel is transposed away from the nerve. All procedure is performed under the microscope for precise manipulation. Gamma Knife (GK), one of radiological therapy, targets its beams onto the trigeminal nerve to modulate the sensitivity against pain. 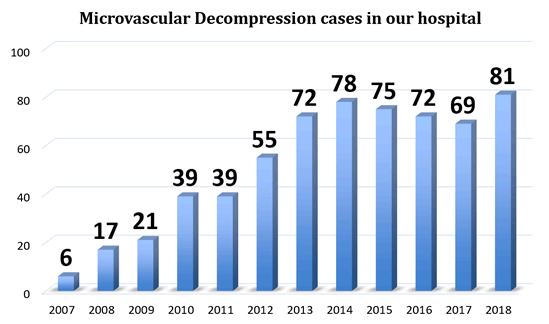 As the compressing artery remains even after GK, the effectiveness is lower than MVD and carries higher risk of recurrence and numbness several months later. 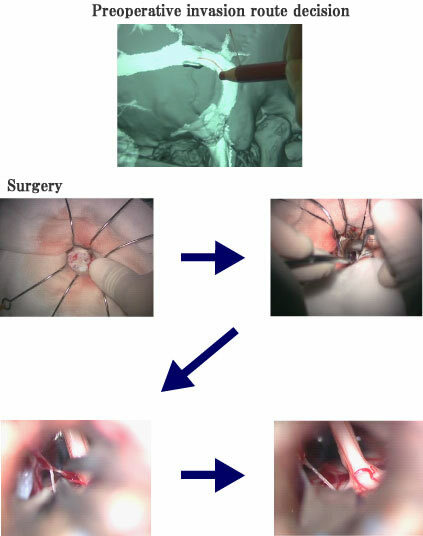 MR images taken by optimized sequence for trigeminal neuralgia are transferred into workstation to be analyzed the relation between the trigeminal nerve and the adjacent arteries. 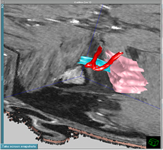 Three-dimensional image helps to understand the precise anatomical relation around the nerve in each patient. This contributes not only safer and faster surgery but also planning for Gamma Knife if it chosen for treatment. 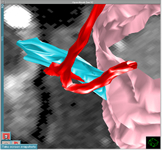 The best treatment for trigeminal neuralgia will be proposed based on the 3-D images as this image reflect the real relation between the nerve and the adjacent vessels as shown below. In addition to the 3D MR images mentioned above, 3D CT will be taken a day before the surgery to identify the precise entry point. This contributes to the minimal skin incision behind the ear through the key hole approach. Day1 ： Admission, 3D Image processing by MRI and CT.
Day2 ： Surgery (Microvascular Decompression), usually finishes within 2 hours. Dat3-4 ： Hospital stay for recovery from dizziness or floating sensation after the surgery. You can leave hospital whenever you feel fine, as no sutures applied on the skin, there is no need to visit hospital to remove them. Surgery is performed under general anesthesia. A short skin incision will be made behind the ear on the same side of trigeminal neuralgia. A small hole, called key hole, is made to expose the dura matter, the tough membrane over the brain. 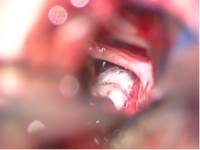 Slight retraction of the brain allows us to expose trigeminal nerve and compressing artery. The artery will be transposed using very tiny Teflon felt completely away from the nerve. Fig.5　Artery compressing the nerve from the behind. The artery was transposed away from the nerve with Teflon felt. All procedures are performed under high magnification using a microscope. Neuro-monitor is also applied to avoid possible hearing disturbance. Most of the cases are expected to become pain free immediately after the surgery. In some case, the patients may feel dizziness for a couple of days. As no sutures on the skin applied, the patient can leave hospital whenever he/she can walk. Preoperative 3D CT and 3D MRI allow us to perform surgery through very small hole, key hole, which enables the patients recover quickly after surgery. Complete transposition of the artery away from the trigeminal nerve leads to complete cure from trigeminal neuralgia.